It’s difficult for a service-based business to stand out next to those who have products to display. Most exhibitors are more interested in selling than making connections and building relationships. As an introvert, it’s challenging to initiate conversations with strangers, especially in large numbers. I had basically dropped trade shows as a marketing strategy, but last year some of our members expressed a keen interest in participating as a group, so I went along with them. Since then we’ve exhibited at a couple of events, and I now have a very different perspective. Let’s look at my previous misconceptions and what I’ve learned. There are lots of ways to attract people to your table! Don’t worry about the “sellers” – it’s their loss. Savvy business owners know that networking isn’t about selling; it’s about getting to know people who may someday become clients, refer clients to them, or help them in some other way. Those who only talk about themselves and their businesses are way less likely to achieve long term success than those who show a sincere interest in the people they’re talking to. Because there were several of us, we each had the luxury of being able to walk around and speak with other exhibitors and attendees while someone else covered the table. It gave us the best of both worlds! We wrote a brief introduction for the group and asked that all of our members use it when starting a conversation. This was to ensure that everyone was giving out the same message, but had the added benefit that no one felt awkward, not knowing what to say. Whether you’re representing an organization or just your own business, it’s very helpful to know ahead of time what message you want to convey. At the same time, having clear goals for any event you attend is beneficial. If you sell products, you may make some sales right from your table, but for service-based businesses, it usually takes several contacts before a potential client will understand what you offer and how you can help them, so don’t set unrealistic expectations. Notice what works, and keep doing it! The Better Business Expo in Ancaster last fall was our first major trade show. 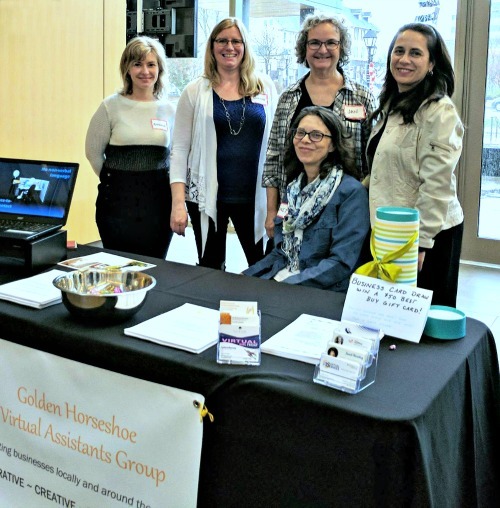 After investing a lot of time getting ready, as well as money on marketing materials, we felt we were well equipped to do it again, and took part in the Social Fusion Trade Show (that’s us at our table in the photo) in Burlington last month. We’re now eagerly looking forward to the Better Business Expo in Hamilton this summer. If you’re there, please stop by and talk to us! Great points. I would also like to add that you shouldn’t be engrossed in conversation with other members of your group while hosting a table or booth. You’re more likely to get more clients if you are standing up front and look receptive to conversation. That’s a great point, Wendy. No one wants to feel that they’re interrupting you, or that you don’t consider them important enough to pay attention to!